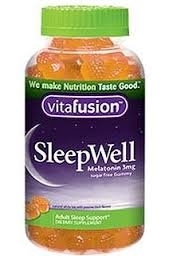 Vitafusion SleepWell Melatonin Sugar Free Gummy is a sleep support formula that comes in a delicious gummy for convenience. Each serving delivers 3 mg melatonin along with passion flower, chamomile flower and lemon balm for added benefit. These white tea and passion fruit gummies taste great and promote sleep cycle regulation. Take two (2) gummy supplements prior to sleep event. Chew thoroughly before swallowing. Maltitol, water, gelatin; less than 2% of: beeswax, citric acid, color (annatto extract), fractionated coconut oil, lactic acid, natural flavors, and sucralose.